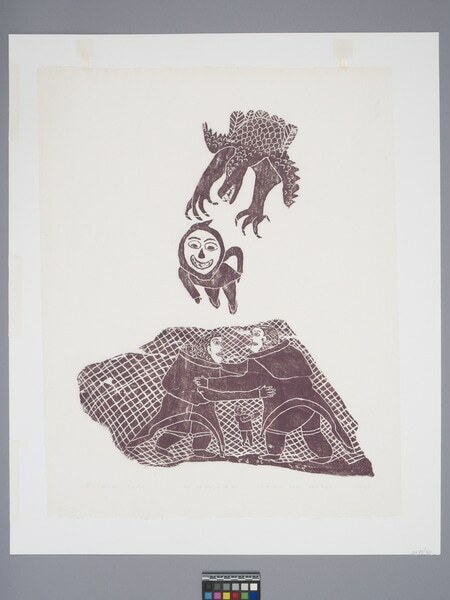 Print depicting dragon-like creature, flying figure and two human figures. Dragon-like creature is at the top of image and is flying down. It has large claws, large bared teeth and scales all over its body. Underneath this creature in the middle of the image is a flying human-like figure with a large moon face, triangular nose, ovoid eyes with large black pupils and mouth in a grin, looking down. Two figures placed against a hatched background, a male and a female wearing large coats and boots, are underneath the flying figure. Their arms are entwined. A very small human figure is in between the two large ones, and an infant is on the female's back. Inuit syllabics are written against the brown background underneath the two human figures. The print number, Inuit syllabics and the date are written underneath the image in pencil.